You know, when you plan a Disney trip. It’s not something where you show up, have fun, then leave. There’s a lot of preparation involved. 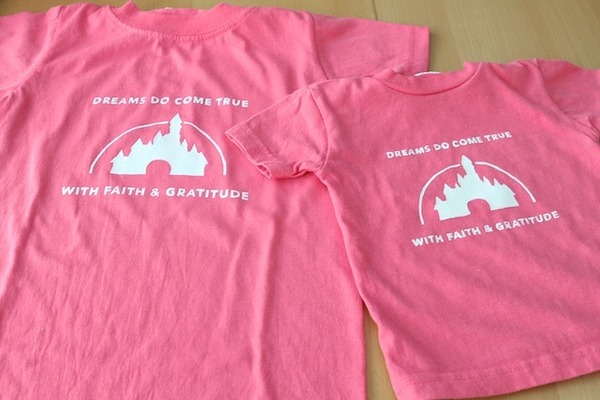 For example, I made us Disney shirts using freezer paper stencil. I would have rather had these shirts professionally made, but when I called around for a quote to have 7 shirts made printed front and back the cost was quite astounding. My only option was to make them myself. I wanted custom shirts and I wanted them a certain way. It wasn’t too bad. At least not as bad as I thought it would be. 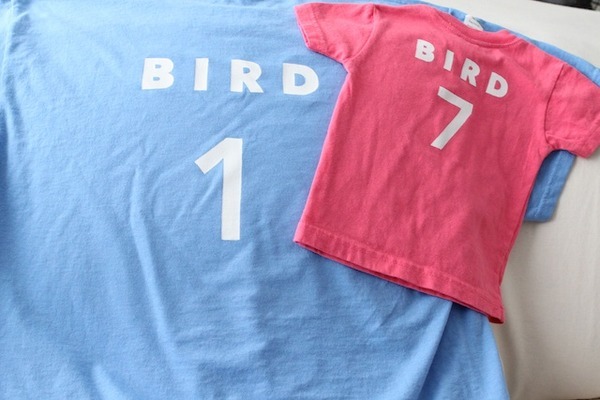 The most difficult part was finding shirts in infant, toddler, girls, adult women and adult men sizes in the same colors. I ran around to several stores and finally found something that worked at Hobby Lobby and JoAnn. 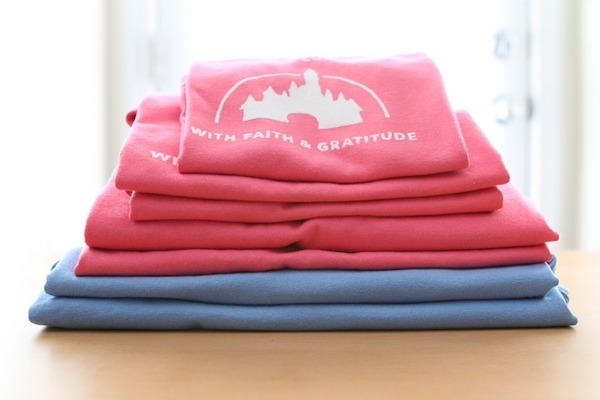 I gathered 5 pink shirts for the girls and 2 blue shirts for the guys. I knew I couldn’t get the guys to wear pink. The best part was designing the shirts. Disney is going to be quite the celebration for us. We are meeting Nathan’s parents there. Nathan’s dad have been going through tough chemo treatments for his terminal cancer. Ever since they found out Nathan’s dad had cancer, their motto has been “Faith and Gratitude.” With faith and gratitude they can overcome any trials in life. And for the past 5 months, he has been doing rigorous chemo treatments. In fact, he is doing his third type of treatment since the previous two only prevented the cancer from advancing and that’s it. When we talked to Nathan’s parents about seeing them this year, we asked them if they wanted us to visit them in Washington or come with us to Disney World. 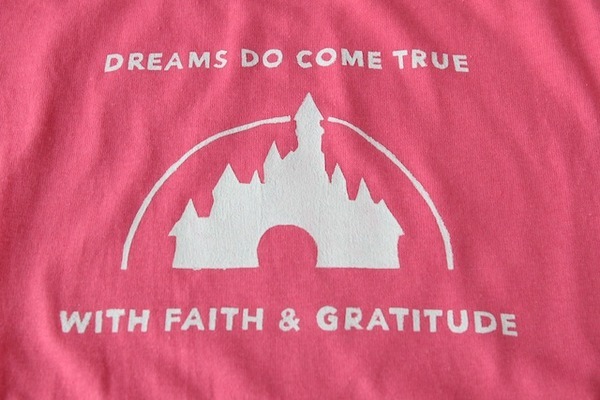 Our girls have been asking them to come with us to Disney World way before we found out about the cancer. So without hesitating, they said Disney World. Amazing people. So when I was thinking about what to do for the shirts, I immediately thought to incorporate the motto “Faith and Gratitude” in there somewhere. I think it turned out pretty well. I used white fabric paint on all the shirts. And for the girls’ shirts I added glitter into the paint to make the shirt sparkly. If you know my girls, you know we can’t do anything less than fancy. Then on the back of the shirts I had our last name and all of us numbered from 1 to 7. Nathan’s parents don’t know anything about it. It’s going to be a surprise for them. » Tell me… Have you been to Disneyland or Disney World before? Did you make shirts or had shirts made to wear while you were there? Have a great time at Disneyworld! We went with my mother-in-law who was also going through chemo at the time and are so happy my daughter got to spend time with her at the “happiest place on earth.” We cherish all of our memories from our Disney trip. Tip: If you’d like pictures in front of Cinderella’s castle WITHOUT all the crowds I highly recommend (if it’s in your budget) reserving a character breakfast at the Crystal Palace for first thing in the morning. Families with reservations are allowed into the park before opening which gives you many photo opportunities in front of the castle, the Disney/Mickey statue, etc. Have fun!! Tiffany these shirts are awesome!! So touching that you are all making the trip together. When you come back let’s hang out please – I’ll come up your way! Love the shirts!!! and love the motto! We visit DW on a regular basis and went with my il’s once…..when the kids were too young to remember really. I hate seeing those that we have known the longest be unwell or show their age. Scary reminder to enjoy the time! We’ve never made shirts, but I made our daughter a hat and embroidered Mickey on it for our visit in Oct. Our son will be getting one soon and we also got a shirt for him that I will embroider Mickey on it as well! I love freezer paper stenciling! I have tried reusing FPS unsuccessfully. Did you cut out 7 stencils???? OMG! Bravo to you! If not, what is your trick for reusing them, pretty please?! Love the shirts! Have a wonderful trip. We did the early breakfast too (Cindella’s Castle) and got an AMAZING picture of our family on main street – the photog was great and managed even though there were people walking around it looks like we were the only ones on the street! Next time we want to bring a 11×14 picture mat instead of an autograph book (which just ended up in a box) then frame a family picture in it with all the characture signatures around it to display. Have a great trip-Disney is all about the memories! !